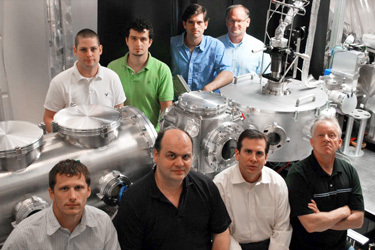 The Texas Petawatt Laser facility conducts fundamental research into exotic states of matter with high energy densities and ultra-high electromagnetic fields. It is the highest peak power laser in the world currently in service. The Texas Petawatt Laser is a part of the Center for High Energy Density Science, which is funded by the National Nuclear Science Agency and the University of Texas at Austin. On this web site, you can see the components of the laser system, meet our staff, read about our research plan, and find links to research publications. For researchers who have been selected to conduct an experiment on the laser, and for those who would like to propose reasearch, we have a section on information for users and prospective users. The Superlative Light • Artist Robert Shults shares his fascination with the concept of petawatt laser science through a series of beautiful and evocative photographs from within the Texas Petawatt lab.